“Mozart’s Musical Wonder” a beautiful, musical book which has been handpicked by the lovely Jenny over at Smallprint to complement the learning opportunities in this box..
A Clapping Roller from Plan Toys – roll it along the floor to hear the lovely sound it makes. A duo of hand-knitted finger puppets – the sounds of a mouse (“ee ee”) and a monkey (“oo oo”) are perfect to introduce your Little Chatter to some first letter sounds. 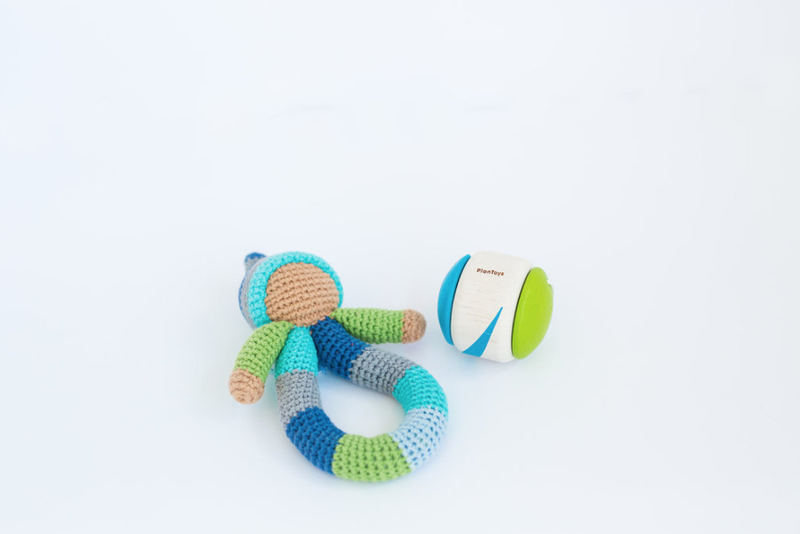 A gorgeous handmade Pixie Ring Rattle from Pebble – to shake along to your Little Chatter’s favourite songs. A pair of maple wood claves - Little Chatters will love tapping these.